Hear and Print these Tutorials! 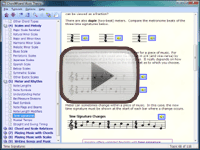 ChordWizard® Music Theory 3.0 is the full version of the How Music Works tutorials, including all the sounds, text searching, bookmarking, and many printing options. How Music Works is a comprehensive suite of multimedia tutorials which explain music in clear, simple language you can relate to. Packed with 115 topics in nine tutorials, and illustrated with 360 diagrams and 750 demonstration sounds, the tutorials start with the very basics of music and advance to topics which are valuable even for professional musicians. Whatever musical instrument or style you are interested in, these tutorials will be an essential source of information and guidance for	years to come.